The same storm which brought record snowfall to Dallas spread heavy snow, with rates as high as 1-2" per hour in places, across east Texas and northern Louisiana. The heaviest snow was mainly north of a line from Jacksonville, Texas to Natchitoches, Louisiana. The 5.4" in Shreveport, LA was the 7th heaviest in records extending back to 1871. This was also the largest snowfall in Shreveport since December 16th, 1983. Natchitoches reported 6.0". Snow amounts in Arkansas ranged up to 5.8" in Texarkana. In Texas, reports ranged from 2.0" near Lufkin to 7.0" at Longview and 10.0" at Lindale. PM Update: The National Weather Service map of Feb. 11-12 storm snowfall totals across north Texas shows the highest amounts along and north of highway I-20. Noon Update: Added seasonal statistics. The Dallas Morning News reports that 170,000 customers are without power in the area. AM Update: The final record daily snowfall for Dallas was 11.2" on Feb. 11. 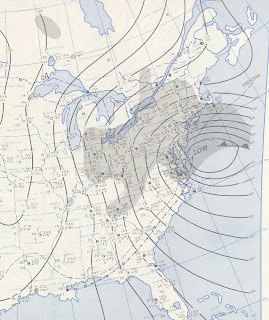 The 24-hour total of 12.5" from 4 am Feb. 11 to 4 am Feb. 12 also broke the 24-hour record of 12.1" on Jan. 15-16, 1964. After dropping record amounts of snow (just over a foot) in the Dallas Metroplex Thursday a vigorous storm is spreading a nasty taste of winter eastward along the I-20 corridor into early Saturday. Already from Shreveport to the Mississippi-Alabama line, snowfall has been in the 3-to-8-inch range. Heading eastward from south-central Alabama, through the Savannah River Valley, to southeast North Carolina, three to six inches of snow will be common before all is said and done. Snowfall could reach 2 to 4 inches as far north as the Atlanta metro and the rain could end as a few inches of snow in Mobile. WAS 7.5 INCHES...SET ON FEBRUARY 17...1978 AND FEBRUARY 25...1924. FEBRUARY 11TH...OF 1.4 INCHES WHICH WAS PREVIOUSLY SET IN 1988. OLD RECORD FOR THE DATE OF 0.89 INCHES SET IN 1970. RECORD FOR THE DATE OF 1.21 INCHES SET IN 1881. THE OLD RECORD FOR THE DATE OF 0.75 INCHES SET IN 1967. BROKE THE RECORD FOR THE DATE OF 0.80 INCHES SET IN 1926. DATE OF 4.2 INCHES SET IN 1926. BROKE THE RECORD FOR THE DATE OF 0.98 INCHES SET IN 1970. DATE OF 8.7 INCHES SET IN 1926. BROKE THE RECORD FOR THE DATE OF 0.76 INCHES SET IN 1926. BREAKS THE OLD RECORD OF 0.78 SET IN 1990. THE STORM TOTAL IS 7.9 INCHES. THE TOTAL FOR THE MONTH IS NOW 29.6 INCHES. FEBRUARY 2010 NOW RANKS AS THE 6TH SNOWIEST MONTH EVER. 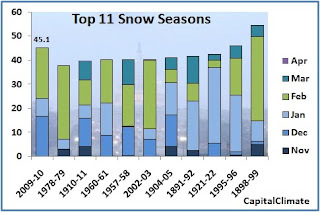 THE SNOWIEST SEASON ON RECORD WAS 82.0 INCHES THE WINTER OF 1950-51. 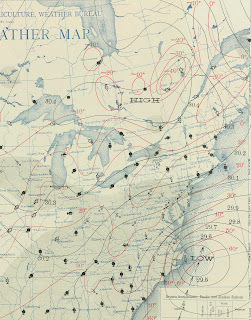 SNOWFALL RECORDS FOR PITTSBURGH DATE BACK TO 1884. A RECORD SNOWFALL OF 10.0 INCHES WAS SET AT HARRISBURG PA TODAY. THIS BREAKS THE OLD RECORD OF 5.2 SET IN 1970. RECORD OF 30.3 INCHES...SET BACK IN 1893. TOTAL OF ONLY SEVEN TENTHS /0.7/ OF AN INCH OF TOTAL SNOWFALL. WASHINGTON DC DATE BACK 126 YEARS TO 1884. RECORD FOR BALTIMORE OF 62.5 INCHES SET IN THE WINTER OF 1995-96. OFFICIAL SNOWFALL RECORDS FOR BALTIMORE DATE BACK 118 YEARS TO 1893. THE PREVIOUS SEASONAL SNOWFALL RECORD OF 61.9 INCHES SET IN 1995-96. PM Update, 2:00: At 2 pm, Washington National is reporting another 1" of new snow. Unofficially, this raises the seasonal total to 54.8", erasing a record which has stood since the winter of 1898-99. (Chart has been updated accordingly.) Total depth on the ground is 21". BWI also reports an additional 1", bringing the depth on the ground to 29". PM Update, 1:25: A National Weather Service Public Information Statement confirms a storm total so far of 8.7". This raises the seasonal total to 53.8", just 0.6" less than the all-time record seasonal total. Dulles is at 8.5" and BWI at 11.9". PM Update, 1:00: Washington National added one more inch in the past hour with heavy snow still falling. Unofficially, this is within less than 1" of the all-time seasonal record. Total depth on the ground of 20" is up 3" from this morning and 7" from yesterday. Noon Update: Washington National added another 1" in the past hour. This pushes the Washington seasonal total to just over 50". Unofficially, National has added 2 more inches through 11 am. If confirmed, Washington will be within less than 3" of the all-time seasonal record. The 3.7" of new snowfall as of midnight brings the official Washington, DC seasonal total to 48.8", moving this season ahead of 1995-96 into second place. 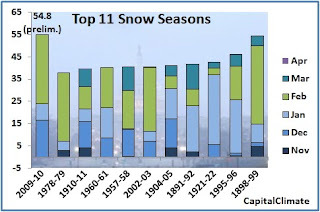 This winter is now less than 6" away from the all-time Washington seasonal snowfall record set in 1898-99. The February total of 24.8" still remains in 4th place, however, behind 2003. With the snow having changed to freezing rain for the last couple of hours, accumulations overnight will likely be reduced from earlier expectations. Welcome Wundergrounders, and thank you Jeff Masters for your generous compliment. I've been a fan of Weather Underground since the earliest days of the WWW. Along with UIUC Weather World, it was one of my first bookmarks on Netscape 0.5. These things are all very well documented and in more more detail in Kocin and Uccellini's now-classic books. One thing that really struck me in comparing these, however, was the big difference in the intensity of the cold air to the north. The other cases all had extremely cold surface temperatures in northern New England and southeastern Canada, frequently in the -20°F to -40°F range. That was not true in this case. As Dr. Masters explained, once all the other elements are in place, it doesn't need to be ultra cold in order to snow, just cold enough. Take a look at the 12Z (7 am EST) surface map for Saturday, Feb. 6. All the right elements are there, including a honking deep 986 mb low parked near the mouth of the Chesapeake Bay, and heavy snow is pummeling the Nation's Capital. Temperatures to the north are cold, of course, but the 0° line is way out of the U.S. Single digits extend from Maine across northern New England and into Quebec. Below-zero readings are confined to central and western Ontario, too far west to be feeding into this storm. 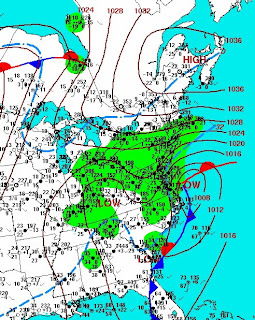 Now consider the 12Z map closest to the heaviest snow for the 2003 event, Feb. 17. The zero line (blue dash-dot) goes from northern Nova Scotia across the northern third of Maine (-22° at Houlton), along the Canadian border and encompasses nearly all of Quebec and eastern Ontario. 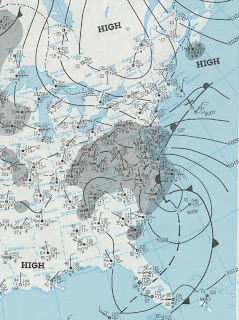 In 1983, the low development is less advanced at 12Z on Feb. 11, but the freezer is working overtime to the north. The zero line (black dash-dot) takes in essentially all of New Brunswick, Maine, New Hampshire, Vermont, about half of New York, Quebec, and eastern Ontario. Peak cold, as plotted, is -26° to -27°. 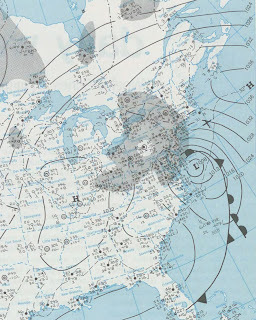 For the President's Day storm of 1979, the Feb. 19 map shows all the usual suspects, although the orientation of the high is somewhat different. Temperature-wise, however, the zero line cuts across a large chunk of New England (-18° at Houlton), northeastern New York, all of Quebec, and most of Michigan. Readings in the -20° range are widespread. The Feb. 7, 1967 picture shows a little less extent for the 0° intrusion into New England, but Earlton, Ontario checks in with -33°, and Armstrong sports a mercury-freezing -39° and an unmeasurable dewpoint. Feb. 16, 1958? Armstrong is back with its frozen instrument, and Pagwa plays "Can you top this?" with -40°. 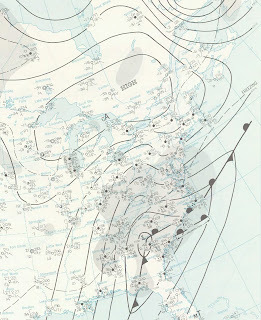 On Feb. 7, 1936, the U.S. has embarrassingly not yet embraced the polar front theory of analysis, but the icebox is stoked with -20° to -40° temperatures. 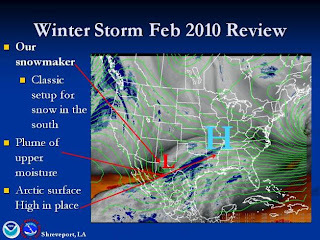 The conclusion I would draw from all of this is that the 2010 storm was distinct from other similar events in the past by having moisture be the dominant element over temperature in producing the extreme snow amounts. 6 PM Update: Added chart of all-time top individual storms. As noted earlier, the storm of Feb. 5-6, 2010 is now the 4th biggest of all time in Washington and the 2nd biggest at Washington National. 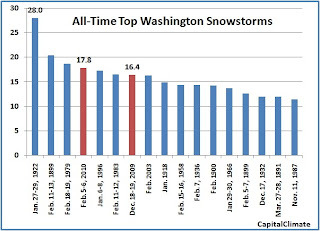 This weekend's epic 17.8" snowstorm in Washington has rewritten the top 10 lists for individual storms, as well as February and seasonal snowfalls with only 1 week elapsed in the month. This month's 21.1" to date just edges out the 21" in 1983 to take fourth place. In the seasonal ranks, the 45.1" reported so far displaces the 1921-22 season and its infamous Knickerbocker storm out of the number 3 slot. With more snow expected in the middle of the week, the second place record of 1995-96 is in serious jeopardy.